People often ask whether we should wear shoes during practice. The answer is yes. Good foot health is important to overall health. Each foot has about 26 bones, 33 joints, 107 ligaments, and 19 muscles and tendons. With such complexity there is increased chance of injury. Injuries/illness in other parts of the body can also manifest as pain or swelling in the feet. Some argue that humans evolved walking and running barefoot. This is true, but life expectancy in caveman days was about 30 years. And we have no historical records of the frequency of foot injuries in cavemen. (Perhaps the lack of shoes is one reason their life span was so short. . .) Some barefoot time is recommended (see below), but not for taiji/qigong practice. In a 2013 study by Dr. Sarah Ridge, a professor of exercise science at Brigham Young University who studies impact injuries in sports, 36 runners were randomized into two groups: one with normal running shoes, the other group with barefoot-style shoes. After 10 weeks training more than half of the runners wearing the minimalist shoes showed early signs of bone injuries in their feet. 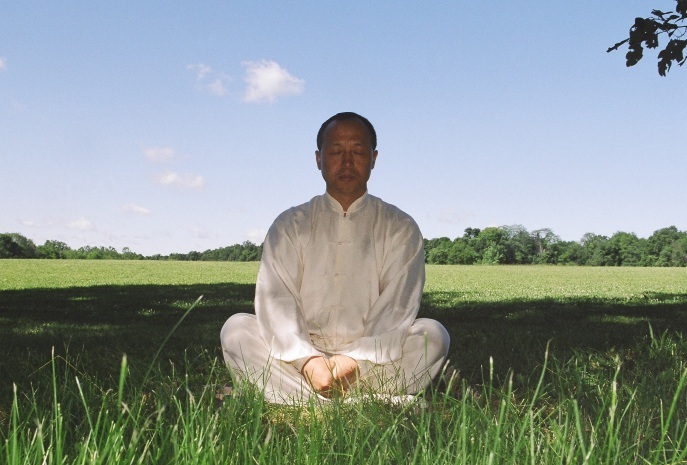 If you train in the traditional way, the curriculum should include standing, sitting, and lying down meditation in addition to your form practice. This approach will develop strength, perfect the alignment of your body, and cultivate effective and fast motor execution of intention. The compound result of this training is powerful movement which will create tremendous pressure on our feet. Further, in (engaged) push-hands the force exchanged between partners can be very high, and with correct rooting/posture the pressure is borne by the feet. The forces exerted will strengthen the muscles and bones in our feet: a unique benefit. However, to protect the feet from possible injury it is essential that we wear good quality shoes. The shoes should ideally be lightweight, with good support (you shouldn't be able to bend the shoe too easily) and traction (shoes should neither be slippery nor have excessively high traction which would make it overly difficult to pivot on the heel or toes). A stiffer heel and medial (inside) support are recommended for over-pronators (those whose ankles tend to roll inwards), and arch support is needed for those with low arches. And of course, the shoes should fit well. Good quality athletic socks can also add considerable cushion for the feet. 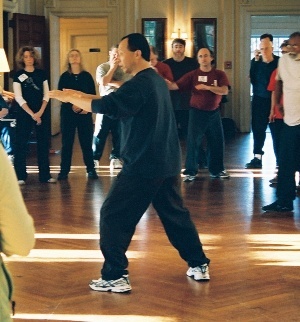 I am often asked about taiji or “kungfu” shoes. Some are good quality, and some aren’t. My advice is to not place style over functionality – whatever style of shoe you select it should have the support characteristics noted above. If the grandmasters of old had access to the quality of shoes that we do today, you would have seen them wearing Merrell’s, New Balance, Asics, etc. in their photos. I often tell people: learn the spirit of the art but do not copy the traditional format blindly. You do not need to buy expensive shoes to protect your feet. Consumer Reports has a good review of shoes - check it out when you have time. And try practicing with different types of shoes that are comfortable to you. I recommend having a few quality pairs from different brands and alternating them. The variety will provide balanced support to your feet. Your feet have the highest concentration of sweat glands in the body. Bacteria and fungus thrive in the enclosed, moist environment. Rather than relying on medication to treat fungus, try wearing socks that breathe and wick away moisture better. Socks with acrylic fibers can wick away moisture better than cotton. You can also go barefoot at times during the day to help keep the feet dry. But avoid cold, which drains your energy. Especially after heavy push-hands training, I was taught to soak my feet in warm water. This has the added benefit of cleaning the feet. It feels good, too. Finally, as always, remember the essential principle of moderation. Too much of anything can result in injury, regardless of the protective clothing worn.